It’s true. I organized everything but the kitchen sink. 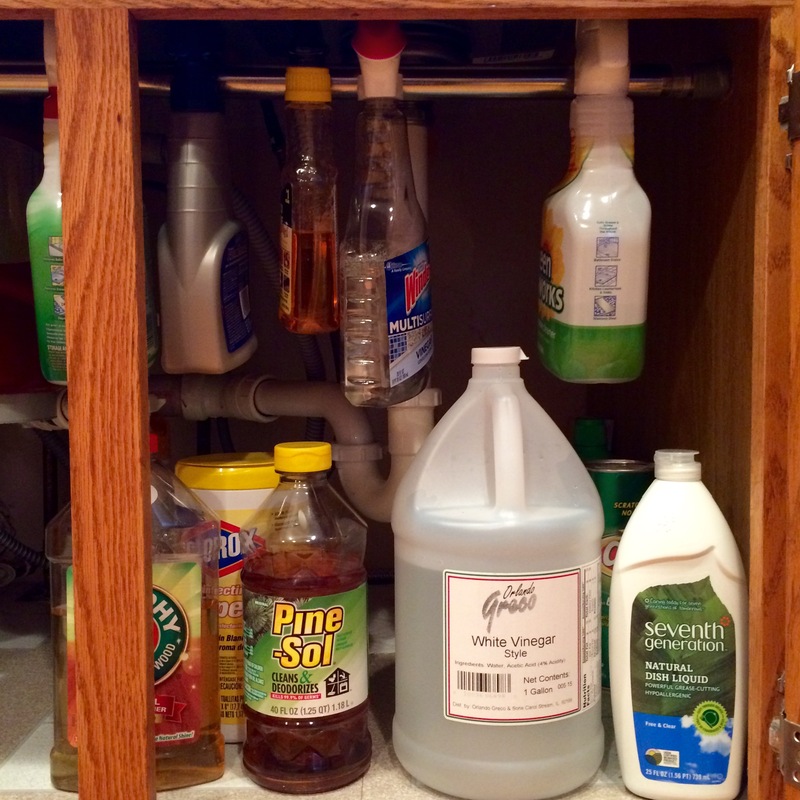 To be more exact, I organized everything under the kitchen sink. We have a double kitchen sink with a spray hose and built-in soap dispenser. Those features make for convenient cleaning. They also make for lots of dangles and doodads under the sink that eat up precious storage space. After accidently playing dominoes one too many times with my cleaning supplies, I knew it was time to come up with a plan. Contact paper and self-adhesive laminate tile squares are long-standing traditions in my Italian mother’s family. If it’s related to furniture and something can be set in it or on it, chances are someone is trying to put some kind of protective covering on it. * So I had already picked up ten squares of tile from Menards and lined the cabinet under the sink with them (which comes in handy given my inability to rub my stomach and pat my head hold the soap dispenser and twist the nozzle whilst crouched on all fours as I refill it). This tile job only cost about $4 and was Mom-approved. As for the storage solutions, I found an overabundance of ideas on Pinterest. However, as enticing as the fancy pull-out drawers are, I couldn’t pull the trigger on that kind of expense. Especially not when all of my problems could be solved for just a few bucks in the bathroom aisle. That’s right! I picked up a tension rod for under $7 and was on my way. After one failed attempt** that saw the rod bouncing onto the floor, I recruited Mr. P. He used all of his might tightened the rod without batting an eye, and I was set. 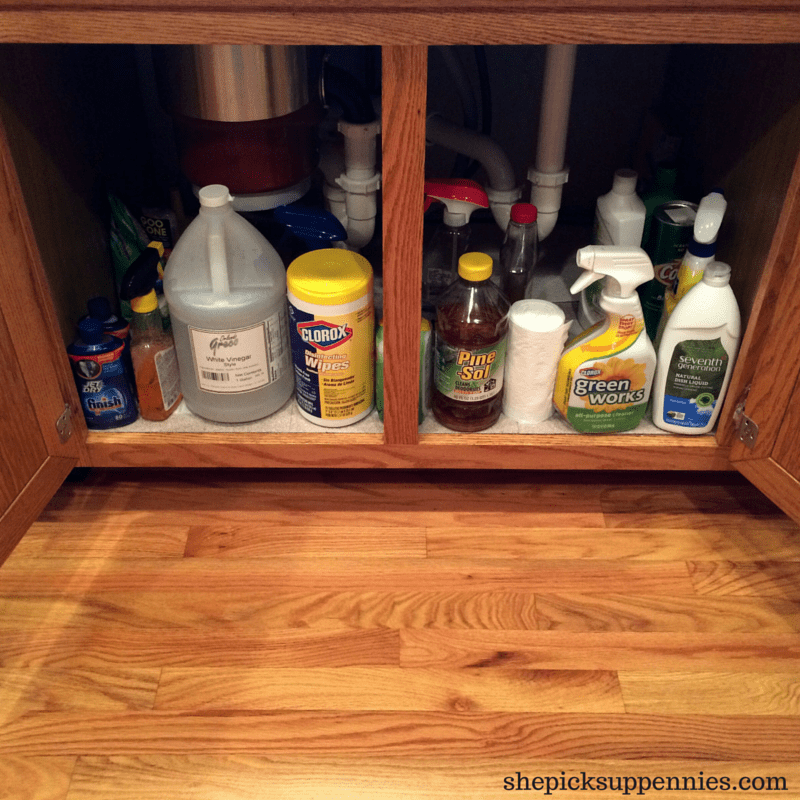 I gathered up all of my cleaning supplies with triggers (think Windex, etc.) and started hanging. I actually freed up an entire side of the cabinet and plan to make more space by switching to more multi-use homemade cleaners. Then tension rod has been up for over a week, and I couldn’t be happier. No more cleaning supply dominoes in this kitchen. The easy-to-install tension rod trick. *Who doesn’t think plastic armrests on chairs are the epitome of comfort? **I didn’t eat my Wheaties that morning. Or any morning. Wheaties are gross. So Tell Me…Does this sound like a tip you would try? 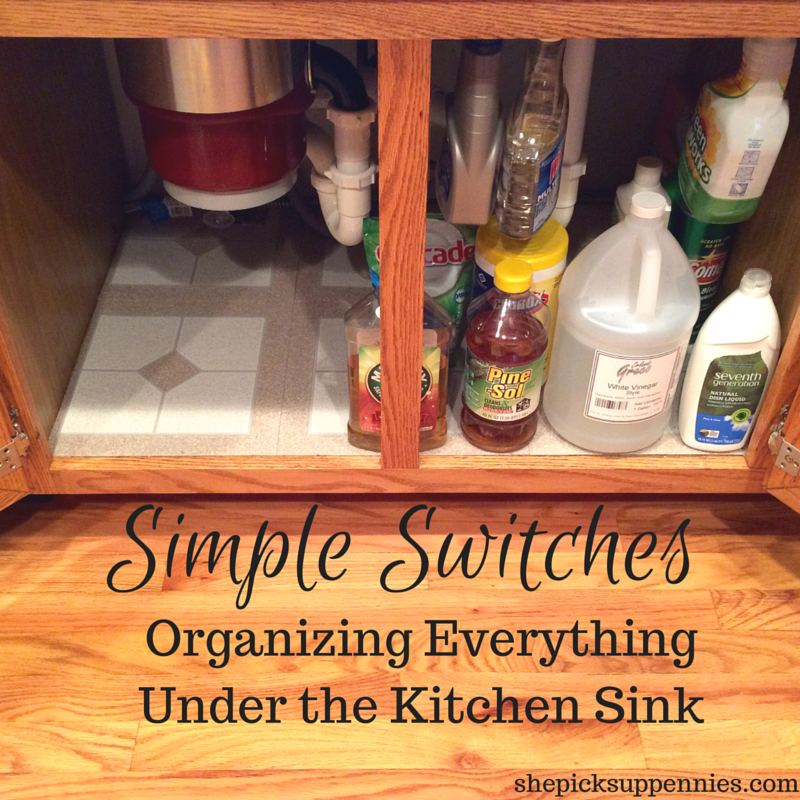 Do you have an organization tips for your kitchen? Dang right, I’d try it! This is one of those forehead-slapping “why didn’t I think of that” ideas. Very cool! If you ever make the switch, I’d love for you to comment with your thoughts. It seemed too easy to be true, but it’s worked splendidly so far! A tension rod! So smart!!! I might have to borrow that idea for underneath our bathroom sink! I bet it would work equally well in a bathroom. Good call! Great ideas, though where are all the random items that don’t belong under the kitchen sink but end up there anyway? Your picture is inspiring another round of decluttering over here.